You will Watch One Piece Episode 450 English Dubbed online for free episodes with HQ / high quality. Stream anime One Piece Season 13 Episode 29 The Escapee Team in Trouble! The Forbidden Move: Venom Demon! Magellan uses a move known as “Venom Demon” that corrodes anything it touches, rendering even Mr. 3’s wax ineffective and forcing Luffy and Mr. 3 to retreat. Mr. 1 and Crocodile manage to capture a battleship, but are unable to move it back to the prison quickly enough, forcing the escapees to come up with an alternative plan. 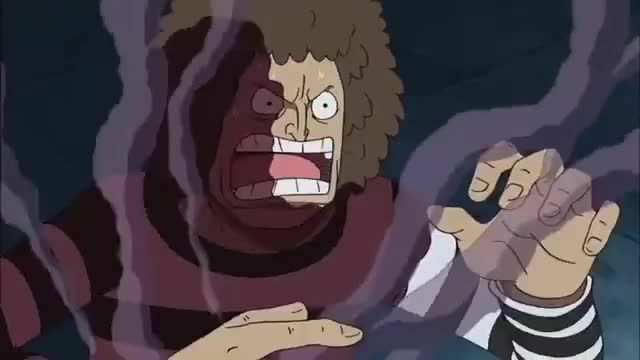 Ivankov recovers from the poison and bursts through the floor to reach Luffy. Luffy has Mr. 3 create a large wall of wax that, despite being unable to permanently block Magellan’s poison, enables him to push Magellan back with Giant Stamp, and Ivankov uses a Death Wink to launch the prisoners into the ocean, where Jimbei has called whale sharks to carry them to the ship.